Here are two energy industry players with dividends over the 5% mark that are worth a deeper dive today. The energy industry has been a volatile sector for a few years now. But if you can stomach the volatility inherent in the sector, there are opportunities for income investors to pick up some decent yields today. Two stocks you'll want to look at are Royal Dutch Shell (NYSE:RDS-A) (NYSE:RDS-B) and Enterprise Products Partners (NYSE:EPD). Royal Dutch Shell is one of the world's largest integrated oil and natural gas companies. The company's history dates back over 100 years, so it has seen a commodity cycle or two. But what really draws the eye here, particularly for income investors, is the stock's around 7% yield. That's more than twice the yield on ExxonMobil's (NYSE:XOM) shares. Since Shell and Exxon are direct competitors, the yield difference highlights the very different views investors are taking of these two companies. The big question is whether or not Shell can keep paying its dividend in the face of weak commodity prices. So far, Exxon has continued to up its disbursement each year, but Shell last increased its dividend at the start of 2014. Since that point, it's been holding the line. Even in the face of a turbulent oil market, Shell's management has been vocal about protecting the dividend (check the graph above -- this isn't the first time it's hit the pause button). Like others in the industry, it's been cutting costs and slashing capital spending budgets. That said, it also just completed the roughly $50 billion acquisition of BG Group, an oil and gas producer that will help it expand in two areas that management believes has a promising future: Liquefied Natural Gas and deepwater offshore drilling. Even if it was a good strategic choice, it was a costly move at a time when the company's top and bottom lines are under pressure. Just how bad is it right now? Shell's earnings have fallen from $4.60 a share in 2011 to just $0.60 a share last year. Earnings were just $0.11 a share in the first quarter, down roughly 85% year over year, so the trend is going in the wrong direction. 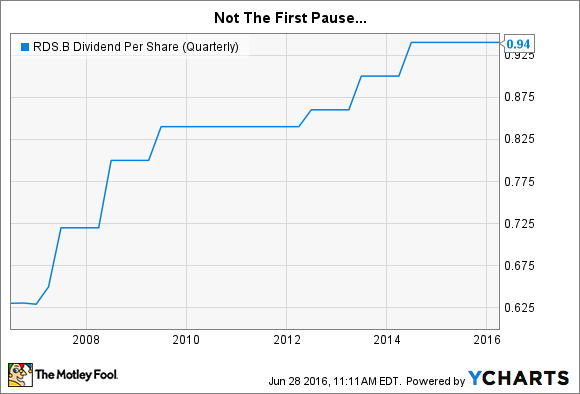 You'd be right to question the company's ability to support its $0.47 a share quarterly dividend. Essentially, Shell has been using debt to keep paying the dividend while also continuing to spend on growth initiatives. Shell's long-term debt has increased from around $30 billion in 2011 to some $73 billion at the end of the first quarter. Those numbers are somewhat jarring, but it may not be as bad as it looks. For example, even with that increase, long-term debt only makes up around 27% of the capital structure. That's up from 16% or so in 2011, but still not an outlandish figure for a capital-intensive industry. And it has introduced a script dividend, giving shares in lieu of cash for those who choose this option. That will help to reduce the cash drain of dividend payments. At this point, Shell really needs higher oil and natural gas prices to push its earnings higher and support its dividend commitments. But so far, it's taking the steps necessary to support its dividend. While that has included adding leverage, the company still appears to be in solid financial shape and, in turn, still capable of taking a long-term view. For more aggressive investors, Shell is worth a little more research. At the other end of the risk spectrum is Enterprise Products Partners. This partnership is one of the largest midstream energy companies in the United States, owning things like pipelines and storage facilities that move oil and natural gas from the well to the point of consumption. This is largely a toll-taker business, with Enterprise getting paid for letting customers move products through its system. As long as we continue to use oil and natural gas, Enterprise's business has material value. That helps explain why its distributable cash flow (the money it has to pay distributions) has gone up for three years despite the oil rout that started in mid-2014. Distributable cash flow was up again, year over year, in the first quarter. Moreover, Enterprise covered its $0.39 a unit quarterly distribution by 1.28 times in the first quarter, leaving plenty of leeway for future hikes. The first quarter represented the 47th consecutive quarterly distribution increase, by the way. With a handsome distribution of around 5.6%, Enterprise and its toll-taker business are well worth a deep dive for more conservative investors. In fact, even those with a more aggressive bent might benefit from including this steady payer in their portfolios. That growth is backed up by the company's continued expansion plans. The company spent $1.1 billion on capital projects in the first quarter, almost all of which was for new construction that will add to revenue as these growth projects are completed. It's got another $2.2 billion worth of projects to work on through the end of this year and another $4 billion or so spread over the next two years. In other words, assuming it doesn't hit any roadblocks along the way, Enterprise looks like it has the potential to keep rewarding unit holders with steadily growing distributions, just like it has for more than a decade. Market dislocation often brings with it investment opportunities. Shell is a more aggressive income play, where you need to believe that management is good for its word that the dividend will continue to be paid. So far, it looks like it's doing the right things to live up to that promise while still trying to position the company for the future. Enterprise, meanwhile, is a more boring business but still easily covers the cash it's distributing to unit holders. For conservative types, the lower yield should be worth the cost of sleeping well at night.